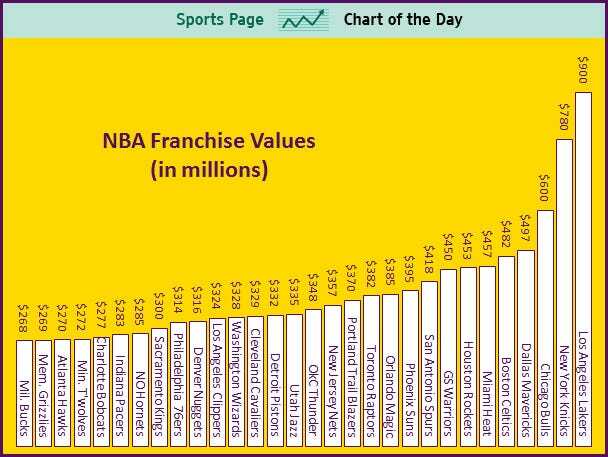 NBA Franchise Values Visualized. How much are they really worth? What bothers me over and over again is that they are trying to communicate a rank, yet they rank the data low to high. Why? In addition, they always use column charts instead of a bar charts, which forces me to turn my head sideways. Ok, one more thing. The source article is centered on the Lakers, so COTD used the Lakers colors. Cute? I think not. I’d say chart junk. I’d go with a simple bar chart like this. Yes, it’s a bit taller, but you can at least read it without needing to go to the chiropractor afterwards. But why stop there? There’s more data available then just franchise values. 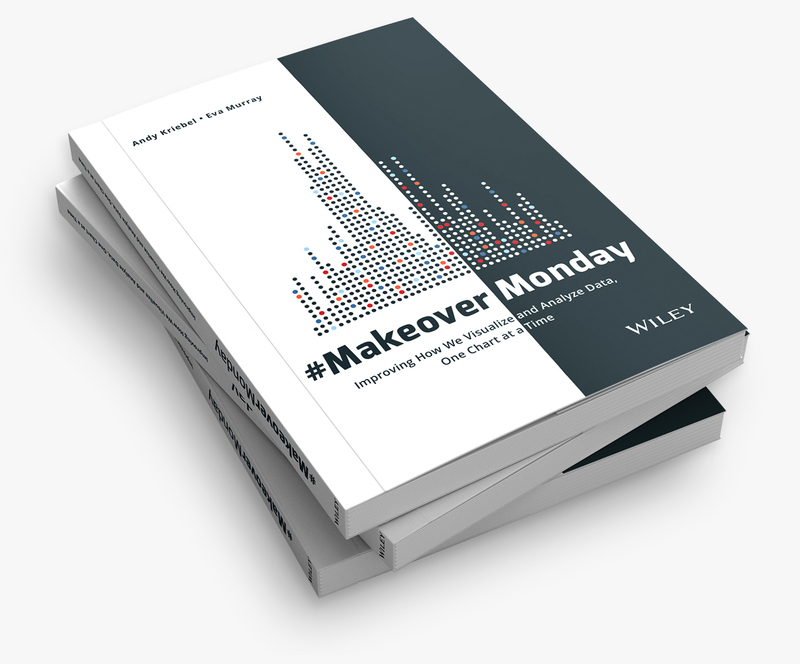 Check out this interactive viz I built with Tableau. 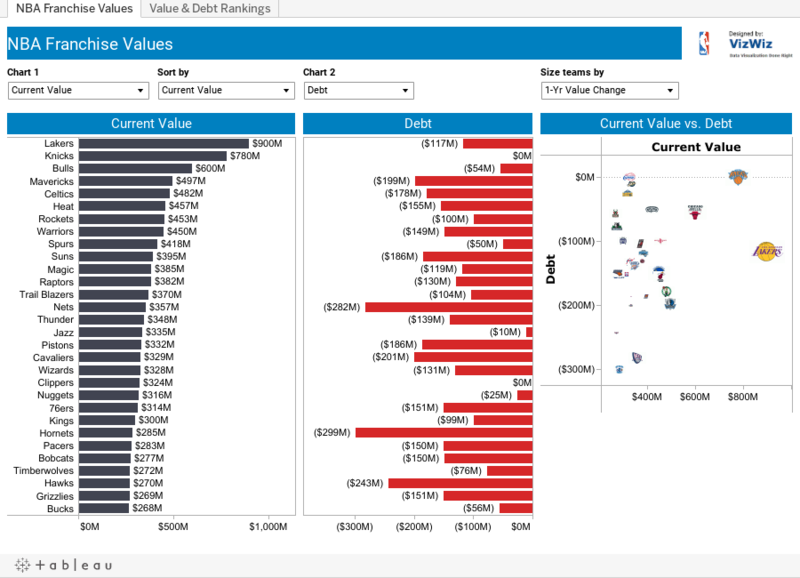 The Value & Debt Rankings viz is a heat map of the rank of each team across the different data points. The article and data only provide the rank based on current value, but I was interested in the rank across all of the data points. I used the INDEX() function in Tableau to create a rank for each field, then used the Advanced calculation to specify the field to rank. Thus I can have a rank field for each data point. While the article stresses the rise in franchise values, what they neglect to address is the heavy debt load on many teams. For example, the New Orleans Hornets are currently valued at $285M, yet they carry $299M in debt. Compare that to the Knicks and Clippers who carry no debt. Now THAT is the way to run a franchise. Awesome! I wonder if these numbers are pre- or post-Jeremy Lin. If pre, I wonder if the Knicks will surpass the Lakers in value next year thanks to "Linsanity". Small detail, but I like the "designed by" badge in the upper right w/ the link back to your site - very cool & something I will use down the road. I didn't notice the tab at first, but when I did, I found the heat map to be very effective. Thanks for the feedback Ben! I stole the badge idea from Steve Wexler. It became much more valuable when you could link a URL to the image. I believe that came in 6.0 or 6.1. I am going to assume these figures were at the start of the 2012-2013 season, but the website doesn't actually indicate the source. Great critique of the original chart and a great viz that tells the whole story behind the value of an NBA franchise. I'm not much into the NBA, but I found this interesting. I want to use team logos for my hockey visualizations. Where did you find the NBA logos? Did you have to manually change each of them to the right pixel size and file type to be used in Tableau? I typically do a Google search to find a website that has all of the logos in one place. 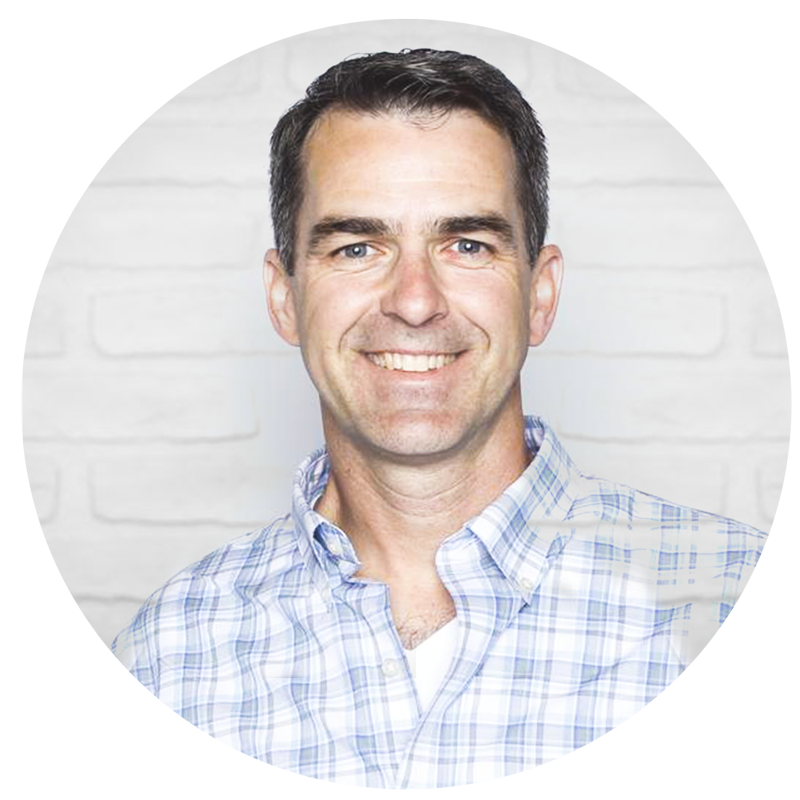 I don't resize the images for use in Tableau, but you certainly can. The best way to understand how to make images work as shapes is via this great blog post from Interworks. The recommend a tool called Paint.NET which I now use as well to create transparent backgrounds. I had trouble getting the NBA images to have transparent backgrounds though. Interworks recommends resizing the images, but I don't do that. The most effective franchise is now the Los Angeles Opposing team, which Forbes principles at $900 million. By the way, you have very nicely described about how much are they really worth.